There should be an analysis and selection of a teaching method appropriate to the training target audience and the objectives. Instructors should adapt teaching methods that reach participants at all skill or literacy levels, learning styles, and experiential levels. A diverse set of instructional strategies should be adapted to address a full range of cognitive levels. Assume that all participants are unequally skilled, or are not confident, in speaking / reading / writing / math. Make sure your handouts are visually appealing and easy to understand. Do not rely on printed material alone. When information is important, make sure plenty of time for discussion is built into the class. Let the group know that they will not necessarily be expected to read material by themselves during the training. If other materials must be read aloud, read them yourself or ask for a volunteer. Never call on someone who does not volunteer. Make it clear that you will not put people on the spot. Let them know that you are available during breaks to talk about this or other concerns. Read all instructions aloud. Do not rely on written instructions or checklists as the only way of explaining an activity or concept. Plan for plenty of small group activities where participants get to work together on shared tasks. This includes facilitating reading, discussing, integrating new information, relating to life experience, recording ideas on flip charts, and reporting back to the whole group. In small groups, participants can contribute to the tasks according to their different backgrounds and abilities. Try to use as many teaching techniques as possible that require little or no reading. At the beginning of a class mention that you are aware people in the group may have different levels of reading and writing skills. Establish a positive learning situation where it is okay not to know and where questions are expected and valued. Participants need to be able to say when they do not understand and to feel comfortable asking for explanations of unfamiliar terms or concepts. Give out only the most important written material. Make any other materials available as an option. If possible, provide audio recordings of key readings so that participants have the option to listen and read along. Explain any special terms, jargon, or abbreviations that come up during the training. Write them on a flip chart. If participants have to write, post a list of key words. This can serve as a resource for people with writing or spelling difficulties. Facilitate the tendency of people to use one of their senses more than others when learning. 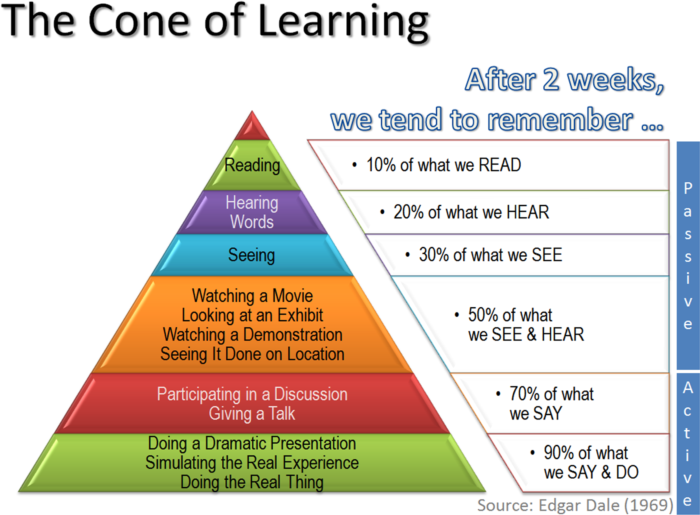 Visual learners (who constitute half the population) learn best by seeing information. Auditory learners (who are less common) learn best by hearing; they remember the details of conversations and lectures and may have strong language skills. Tactile learners (or kinesthetic) learn best by doing; and prefer hands-on experience. Give participants a task such as a question or problem to solve, an original example to develop, etc. Have them work on this 2-5 minutes alone (think). Then have them discuss their ideas for 3-5 minutes with a partner sitting next to them (pair). Finally, ask or choose pairs to share their ideas with the group (share). Provide a scenario for them to read. Have them discuss and analyze the case, applying concepts, data, and theory from the class. They can work as individuals or in groups or do this as a think-pair-share. Consider combining this with a brief in-class writing assignment. Enable them to create visual representations of models, ideas, and the relationships between concepts. Have them draw circles around concepts and connect phrases with lines. These can be formal or informal, individual or group. Allow participants the opportunity to take a position and provide information to support that view. Consider asking participants their personal view on an issue and then make them argue the opposite position. Games such as jeopardy and crossword puzzles can be adapted to course material and used for review, for assignments, or for exams. Ask each participant to identify at least one question related to the material s/he doesn't understand, and to try to answer a question raised by another participant. Encourage them to ask questions; and allow others to volunteer answers. Provide participants who ask/answer questions receive a "treat" (i.e., small candy bars, gum, and boxes of raisins.